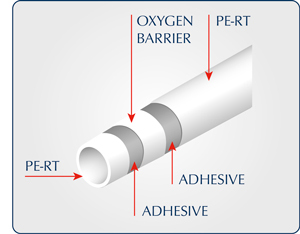 PE-RT Barrier Pipe incorporates an EVOH barrier layer within the pipe wall. This prevents permeation of oxygen through the Tubing. The mixing valves, boilers and other components used in the underfloor heating systems are ferrous (metallic) and are subject to corrosion. To eliminate corrosion due to oxygen permeation, PE-RT oxygen barrier pipe should always be used for underfloor heating. The maximum rate of oxygen permeation permitted for tubing used in heating systems is specified in the German DIN Standard 4726. It states the allowable permeation should not exceed 0.1 grams/m3/day at 50C°. PE-RT Barrier Pipe surpasses this requirement and so virtually eliminates the permeation of oxygen through the pipe wall. 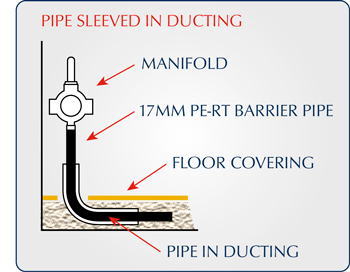 PE-RT pipe should be sleeved in ducting when passing through walls, expansion joints and where it enters and exits floor screeds. GS Underfloor Heating also recommends the use of ducting to limit thermal emission in areas where the pipe runs are very close together such as near the manifold position, to prevent excessive hot spots in this area. It may also be used where pipes are running under kitchen units or other fixtures where heat emission is not desired. 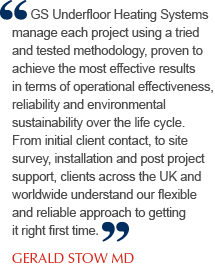 The areas where ducting should be used are shown on the Pipe Layout Drawing supplied for each underfloor heating project designed by GS Underfloor Heating.